Kathrin Klass may be smaller than her competitors, but she certainly isn’t quieter. 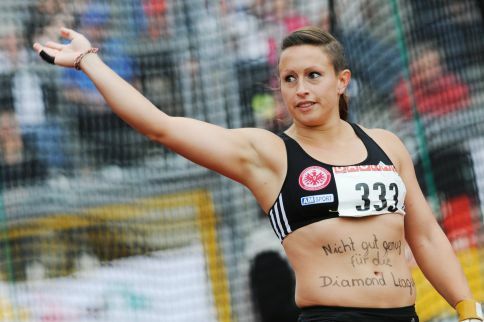 The two-time German Olympian is one of the most vocal advocates for the hammer throw and is leading an effort to get the hammer throw included in the Diamond League. Her recent writings have garnered the support of the German athletic federation. Klaas also is as aggressive in the ring as she is outside it, with a personal best of 75.48 meters (16th on the all-time world list) and a fourth place finish at the 2009 World Championships. While she is now clearly focused on London, she took time to answer a few questions in June about training and the current state of hammer throwing. Enjoyed the interview Martin. We need more people such as your self helping to promote the Hammer as the exciting throwing event we see it as. From this interview, She demonstrates Her strong desire, along with others, to get the recognition of the hammer as a show case of Track and Field and being included, where it has been excluded,and this should be the ultimate goal. Starting Youth Programs around the Globe would get parents and other adults both exposed to this event and involved through youth. It’s an event that needs to be included in High School Athletic Programs. 1 State out of 50 has it. Why? If this is going to continue to be an obstacle, then we as individuals, need to do what few are doing and start our own Hammer Club System. Throw For The Road Hammer Club. we need to have the youngsters enjoying it and being able to look up to those in the top. Hammer as a Diamond League event means TV coverage and publicity. Starting hammer supportive clubs and train coaches. In my opinion starting on “both ends” as in “top and youngsters” will finally bring our sport forward. The coaches that have the desire to become better in developing hammer throwers, need access to materials, whether it be successful coaching fundamentals, Coaching clinics (learning from those with established successes), funding, help with facilities and equipment, and promotion in the local areas to recruit our kids to this exciting throwing event. In this Country, so many organized sports from soccer to baseball, basketball to football. This is the level we need to put our hammer at. When you look out at the thousands of Sports parks that are involved with these other sports. I like to imagine there are Hammer cages set up in spaces such as these. SMILE!! My kids, mostly girls, are well aware of your accomplishments as well as other women and men along with their stats for hammer. So yes, you are correct in saying… “we need to have the youngsters enjoying it and being able to look up to those in the top”. Lets look forward to those of the Diamond League, moving towards the inclusion of the hammer as a Diamond League Event. The excitement of this new 85.57m JWR in Barcelona is evidence of what attention the hammer can generate.